It's been a long road for this determined little dog named Daisy - one she's scooted, hopped and rolled down as a way of overcoming her disability. But now, thanks to some new prosthetics, she's finally running. "Daisy was found by an animal control officer wandering the streets as a puppy, and was later scheduled to be euthanized," her owner wrote on Facebook. "Luckily, she was rescued a few hours before being euthanized. Several months later, she was adopted to a loving forever home. Daisy has congenital deformity in her front legs, which makes her walk and run like a bunny hopping around." Though she became quite skilled at bouncing on her hind legs, Daisy's new family looked for ways to make it easier for her to get around. Eventually, they fitted her with a little wheelchair that helped her enjoy walks outdoors without getting so tired out. Daisy enjoyed her newfound mobility - but it soon got even better. Two years after getting her wheels, Daisy's family began to notice that the device seemed to be putting strain on her spine, so they began to explore other options. 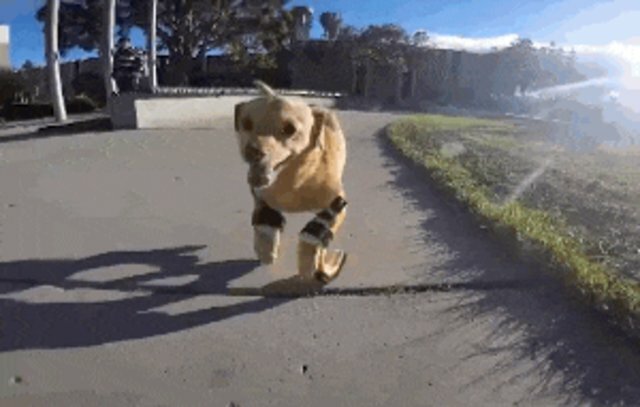 A few months ago, they picked up a pair of prosthetic limbs for dogs, which would help improve her posture by replicating how her front legs might work if they weren't deformed. It was slow going at first for Daisy to become acquainted with her new prosthetics, but her dedication more than paid off. Here she is now, experiencing for the first time what it's like to run. "Our mission is to raise awareness of the special needs, as well as the dogs and cats in the shelter that are considered unadoptable due to their physical appearances." Visit Daisy's website, or follow her on Facebook and Instagram to keep updated on her amazing progress.